Card Text Play: Deal 3 to a creature and 3 to a neighbor of that creature. What happens if I play Mighty Lance and there is only one creature in the battleline (i.e with no neighboring creature)? You always resolve as much of an ability as you can. Therefore, you deal damage to the first creature and the rest of the ability doesn’t resolve. 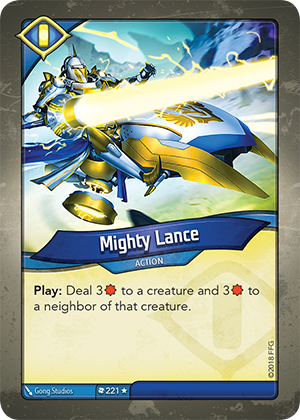 Does Mighty Lance deal damage simultaneously to all affected creatures? Yes. If multiple creatures are damaged by a single effect, that damage is dealt simultaneously. Therefore, all damage dealt from Mighty Lance is dealt simultaneously.